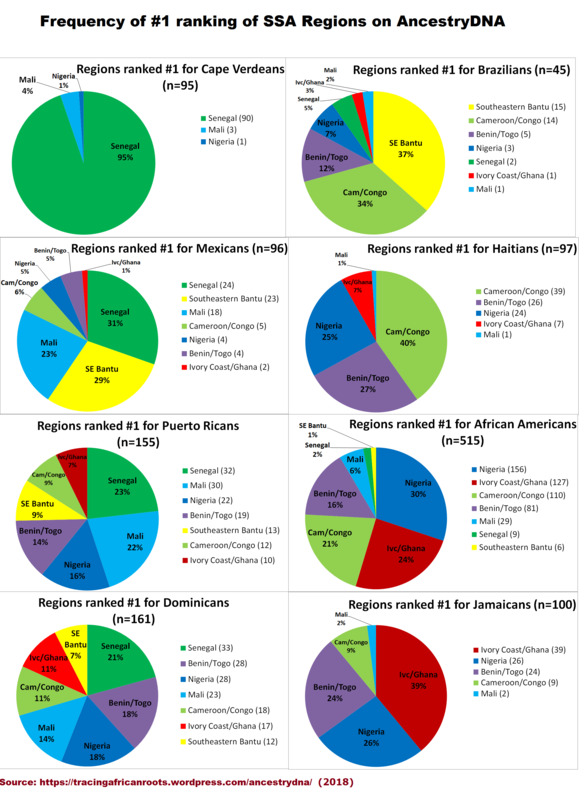 In order to provide a broader perspective on the complete DNA make-up of Afro-Diasporans I have this time also analyzed the non-African regional scores on AncestryDNA. Enabling a continental breakdown for my 8 sample groups. Mainly based on 860 results for people from 8 nationalities1. Although the total number of results and nationalities in my survey is even greater. Generally speaking also the non-African group averages seem to be reasonably in line with historical plausibility. 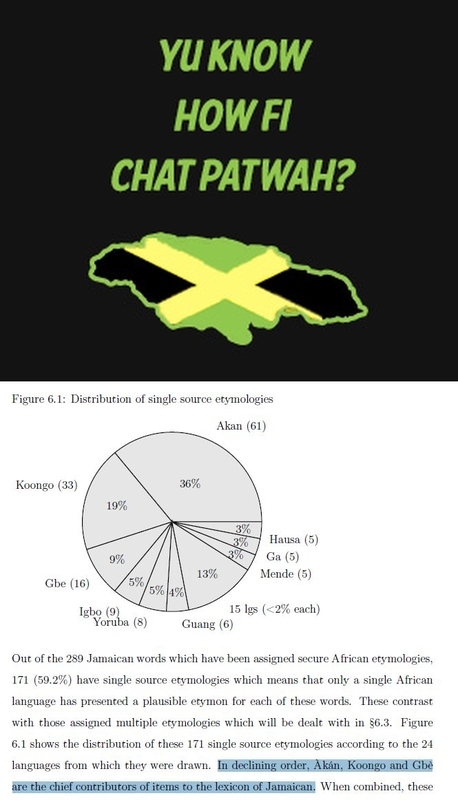 Amerindian, Asian and Pacific trace-amounts are not being left out. These scores are often labeled as low confidence regions and dismissed as just “noise”. Rightfully so in some cases. But given correct interpretation and proper follow-up research at times these scores can still potentially lead you to distinctive ancestors. Furthermore my survey results are now also allowing for a more detailed discussion of the European breakdown as being reported for Afro-Diasporans. 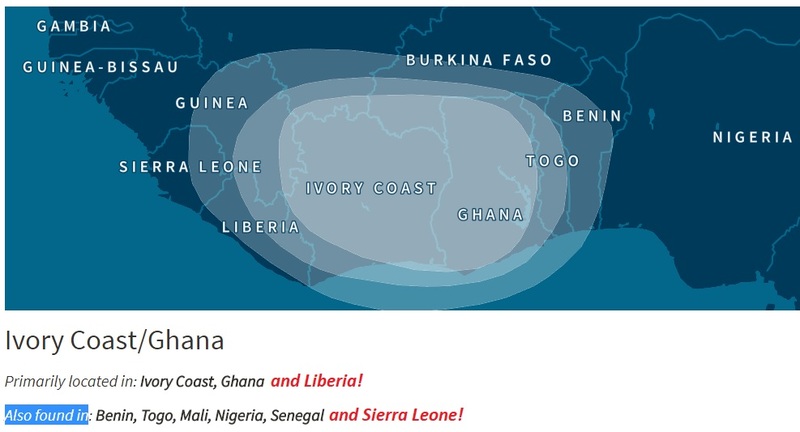 In 2013 AncestryDNA updated their Ethnicity Estimates to include a detailed breakdown of West African DNA. Pioneering when compared with other DNA testing companies. 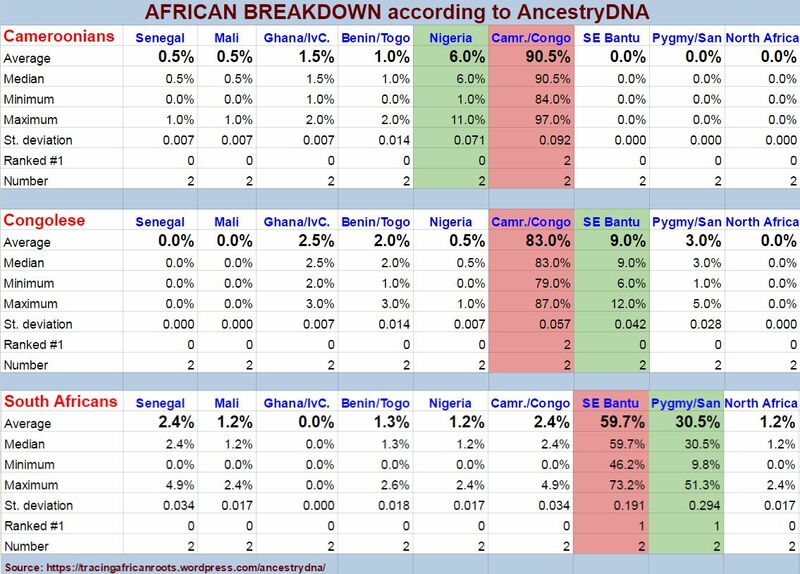 Soon afterwards I started collecting AncestryDNA results in an online spreadsheet in order to conduct a survey of the African regional scores being reported by AncestryDNA. At first only for people of the Afro-Diaspora and later on also among Africans. My main research goal has always been to establish how much the AncestryDNA results on an aggregated group level can already (despite limitations of sample size and other shortcomings) be correlated with whatever is known about the documented regional African roots for each nationality. As well as to improve correct interpretation of personal results. 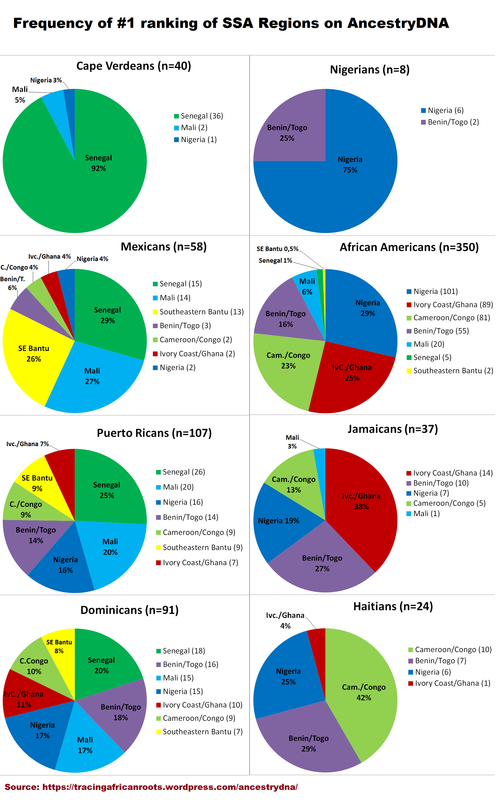 In May 2016 I published my first summary of my Afro-Diasporan survey findings based on 707 results for 7 nationalities (see this blog post). My survey has been ongoing ever since. Right now an update of AncestryDNA’s Ethnicity Estimates seems even more imminent than it was in 2016 (when it was canceled in the beta phase). So that’s why I will yet again provide a “final” overview of my survey findings 😉 . Mainly based on 1,264 results for people from 8 nationalities. Although the total number of results and nationalities in my survey is even greater. A major addition is the inclusion of 45 Brazilian results. Their predominant Central African profiles (as measured by both “Southeastern Bantu” and “Cameroon/Congo”) are quite striking when compared with my other sample groups. This outcome reinforces how the African breakdown on AncestryDNA has been reasonably in alignment with historically documented origins of the Afro-Diaspora. Unlike any other DNA testing platform I’m aware of and therefore not to be lightly dismissed despite inherent imperfections. In the second part of this blogseries I will also provide an overview of the non-African regions (Amerindian, Asian, Pacific etc.) being reported for Afro-Diasporans. As well as a more detailed analysis of their European breakdown. 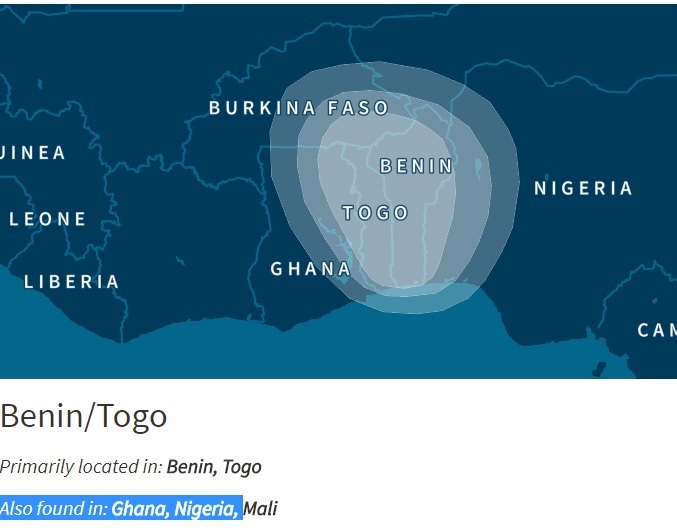 The so-called “Benin/Togo” region seems to be quite predictive of Beninese origins (based on two results). However in addition ancestry from eastern Ghana and southern Nigeria might also be described by this region. You will need to perform your own follow-up research in order to find out more specifics. Naturally this overview is not meant to be representative per se because these persons are in the first place individuals with unique family trees. It is mainly to show the variation across the Afro-Diaspora. Nonetheless I strongly suspect that many patterns to be observed will still be valid as well for other people of the same nationality or ethnic (sub)group. For this overview I specifically chose people with one single predominant African regional score on AncestryDNA. In order to see how Ancestry’s “Ethnicity Estimate” lines up with predicted African DNA matches. More detailed analysis will follow in this blog post. If you continue reading you will also come across a section featuring inspiring stories of people who were able to reconnect with their African kin through DNA testing.